Young flag bearers placed in direct line of fire. See some of the Cardiff City mascots soaked by a sprinkler prior to kick-off as they hosted Leeds on Tuesday night. Several children had been given flags to wave and lined up to form a pathway onto the pitch for the players emerging from the tunnel for the Championship clash. 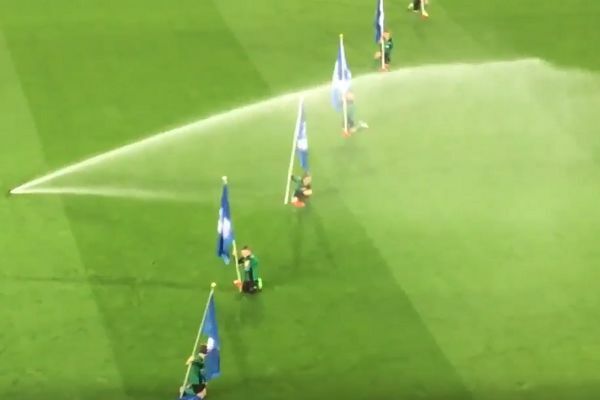 However one sprinkler had also been placed in the vicinity and appeared to be pointed directly towards a couple of the youngsters who bravely cowered behind their flags in an effort to prevent themselves getting wet. It looks like they did get quite wet though.